What are your Favorite Cars??? Re: What are your favorite cars??? I've also had a few wagons myself. I want one like the 57 buick in your link. What kidna wagons have you had? When I was growing up our family had a 67 impala wagon. 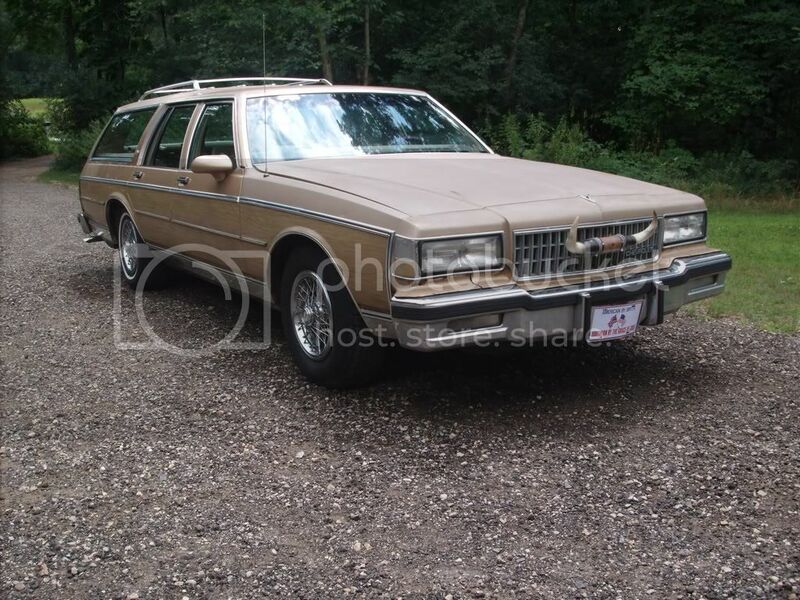 then when I was older my dad got an amc sportabout wagon. the last one he bought was a 77 volare . I have owned a few, a toyota, chrysler, and 3 volvo wagons. IMO the old volvo 240 wagons are hard to beat. Nice, my dad's first car was a 66 Caprice Wagon with a 396 and a TH400. It had been my grandpa's. He was a station wagon man and had many of them. When I was a kid, mom had a 1977 Ford LTD, and I fell in love with that car. She also had an 81 AMC Eagle. But the LTD was part of my inspiration to buy my Caprice. I just returned from Crawford, Texas where I attended the quarterly meeting of the Lone Star chapter of the Plymouth Owners Club with my dad. The two most noteworthy cars are pictured below, along with my '37 Plymouth touring sedan--this is a shot sent to me when I was considering buying it. I'm afraid it is a little more deteriorated now. Jester, your '37 is very nice. I'd love to have a car like that when I grow up! My family had a '57 Fury like the one in your second photo but it was a station wagon. Ours was red and white. Thank you, Dennis. The only drawback to owning a classic car is you can't go anywhere in it incognito!!! That red and white wagon your folks had would have looked right at home on 1950's & '60's highways-- a classic color scheme of the time. Oooh, that tickles a memory! Right around 1960, my Dad bought a Plymouth Fury station wagon so we could tow our Airstream trailer around the country on vacations. As I recall, it had a 383 V-8 that sounded so cool, and a four-speed on the steering column. I was too young to drive, but he let me start it, and move forward and back in the driveway (which was only about twice as long as the car!) It wasn't a wonderfully good-looking car, but I just shivered at the feel of all that pent-up hosepower, even at my tender age! This must be the Plymouth Fury forum. My parents had a 1961 Fury that was white with a red roof. They had originally bought a new 1960 Chrysler convertible that leaked like a sieve when it rained. They took it back to the dealer so many times to have the problem fixed that the dealer took the car back and gave them a new Fury hardtop, instead. I believe the 57 Fury was the evil car in the movie 'Christine," wasn't it? 'Christine' was supposed to be a '58, Dan, but the body for those two years was virtually the same. Mr. King took alot of artistic liberties in the book when he decribed the detatils of the car. The biggie is the original owner ordering the car in red/white. 1958 was the last year that Fury was the top-of-the-line, low production, special order performance option, was only available in two door hardtop or convertible(? ), and was available in one color scheme-- 'Fury' white with buckskin beige interior. The cars used on the movie set were Belvedere hardtops with Fury trim & badges added on. The two cars pictured above are surviving examples of SUPER low production runs. The '56 (debut year for the Fury) had a production run @ 5000. '57 was between 8000 to 10,000. I don't recall any figures for '58, but I recall hearing that all auto production suffered from economic recession that year, so the figure should be lower than '57. Also, Chrysler's QC for '57 was SO bad, sales figures were further affected by the bad taste left in consumers' mouths. In '59, the FURY name was assigned to a trim option instead of a performance option, and is the first year the Fury badge was put on four door cars & station wagons. You could still get a hot car with this name-- if you checked the 'Golden Commando" option on the order form. For '59, this also included a trim option of white paint/ tan interior. "Hey Tex, what's yer new car?" "Well'n I don't rightly know what it is, bought it down at Gregs All American Dodge/Chrysler, the name on the trunk says it's a Dodge iJg-9000.45kiP"
Yeh, I think it's got a go-kart engine under the back seat and the missus keeps tellin her girlfriends it's "Cute as a bug", whatever that means, it shore is small, I think the whole thing ud' fit in the trunk of my daddy's old Fury." "Bet it good on gas though"
"Yep, I ain't had to fill er up since I bought it last September." Heck, I feel outnumbred by Mopar Heads Rite now! 1966 Caprice Wagon - Looked Exactly Like this Down to the Color. Not to mention other goodies. But this just goes to show there must be a genetic trait somewheres. Just got my torrid Red 2009 Challenger R/T. Funny thing is, driving this car gets me more attention than my neighbor's Corvette. Also the gas mileage is better than my 1999 6 cyl car, and it has a 378HP V-8 ! The Challengers sure are sharp looking cars-I've seen several driving around, and they look downright scary when they're coming at you. I like the look of the new Camaros, too. Haven't seen any out on the road yet, but have seen them here and there(just got back from Disney World, and the Test Track ride at Epcot had one on display).
" Also the gas mileage is better than my 1999 6 cyl car, and it has a 378HP V-8 !" I noticed a similar thing. Back last October, I traded my much beloved '94 Maxima for an '04 Lincoln LS. The Maxima was a 3L V6, and about 160 HP. The Lincoln has a 3.9L V8 that gets 280 HP, plus it's a heavier car, is geared much more aggressively(with a 3.53 rear end), and still manages better gas mileage. My Maxima got about 15 mpg driving around town, and 22-23 on the interstate. I get a consistent 18-20mpg out of the Lincoln driving around town, and an easy 25mpg or better on the interstate. The Lincoln's better is every way I can think of-it's a whole lot more fun to drive(more power, stiffer suspension, more responsive), has a much nicer interior with more "goodies", looks better, has more space, and does all of that while getting better gas mileage. I like the new camaro's too, but the styling is not as "old school" for me. It looks like a 1969 that has been sat on by an elephant for a second or two.... I think the challenger will ultimately be a sleeper collector car 20 years or so from now.